Britain's first bus powered by human waste is taking to the streets. The 40-seater "Bio-Bus" is fuelled by biomethane gas generated by the treatment of sewage and food waste at a processing plant. A single tank of the gas, which is produced using the typical annual waste of five people, is enough to power the vehicle for 190 miles. Bosses said the ground-breaking vehicle will improve air quality and proves there is value in human poo. The maiden voyage will see the first passengers travel on the route from Bristol Airport to the historical city of Bath, Somerset. The gas is being produced at a Wessex Water sewerage plant run by energy firm GENeco. Mohammed Saddiq, director of GENeco, said: "Gas powered vehicles have an important role to play in improving air quality in UK cities. 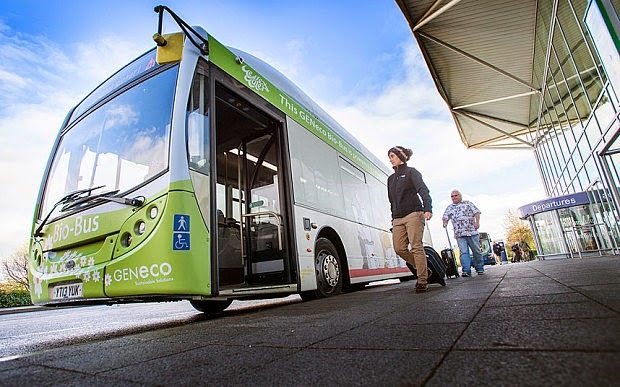 "But the Bio-Bus goes further than that and is actually powered by people living in the local area, including quite possibly those on the bus itself." The annual waste of a bus-load of people would provide enough power for a return journey from Land's End to John O'Groats while producing less emissions than a diesel engine. Charlotte Morton, chief executive of eco-friendly organisation Anaerobic Digestion and Bioresources Association, said: "The bus also clearly shows that human poo and our wasted food are valuable resources. "Food which is unsuitable for human consumption should be separately collected and recycled through anaerobic digestion into green gas and biofertilisers, not wasted in landfill sites or incinerators." GENeco this week also became the first company to start delivering gas generated from human waste directly to 8,300 homes by the national grid. The waste plant in Avonmouth, Bristol, treats 75 million cubic metres of sewage waste, and 35,00 tonnes of food waste, every year. Using anaerobic digestion - the process of using bacteria to break down substances in the absence of oxygen - the plant is able to produce 17 million tonnes of biome thane a year.